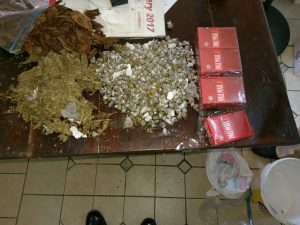 The marijuana and cigarettes that the security forces found at the Timehri Prison. As efforts continue to tighten security at Guyana’s prisons, the security services have found more prohibited items at two jails, resulting in prison officers at one prison receiving death threats for the seizure of drugs, Director of Prisons, Gladwin Samuels said Thursday. 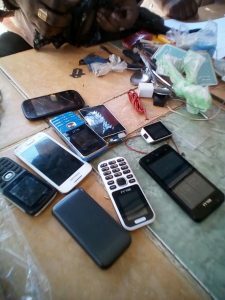 He said a probe has been launched into the discovery of cellular phones and narcotics at the Timehri Prison. “A prisoner indicated that a prison Staff took pay for the items to pass during a visit. The discovery has caused the owner much pain and he is talking about killing Prison officers. The Police are called in to investigate,” he said. 12) Three hundred and five (305) grams of cannabis. 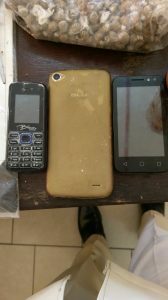 Three of the cell phones that the security forces said they found at the Timehri Prison on Thursday. Earlier Thursday, the Director of Prisons again expressed grave concern that prison wardens were colluding with other persons to breach security at the country’s jails by facilitating the entry of prohibited items. Samuels’ comments were triggered by the discovery earlier Thursday of a bag containing a large quantity of marijuana and cigarettes that were allegedly smuggled into the Lusignan jail by three employees of Cevon’s Wast Management company. Several cell phones and other items found at the New Amsterdam Prison on Thursday, August 3, 2017. The Guyana Police Force said at about 10:45 Thursday morning, police acting on information conducted a search of a vehicle owned by a Waste Disposal Service, which shortly before entered the “Old Compound” of the Lusignan Prison and found therein a haversack containing in excess of 860 grams of cannabis and two cartons of cigarettes. The driver and two porters, one being a female, were searched and 24 grams of cannabis was found in the driver’s pants pocket. The driver, 25 years old, of Middle Walk, Buxton, East Coast Demerara and the porters; a 26 year old male from Russel Street, Charlestown, Georgetown and the 32 year old female of ‘C’ Field Reserve, Sophia, are in custody assisting with the investigation.